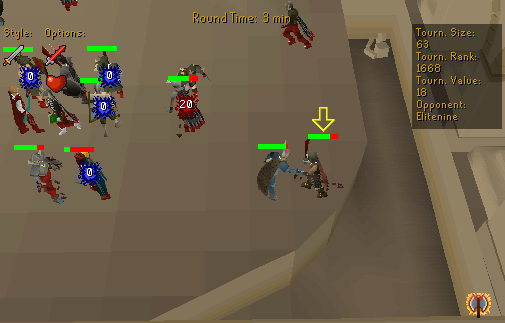 The Duel Arena is a great place to fight if you want to fight another person without losing your items. The main fights are for all players, but the tournaments are for members only. You set your own rules, whether or not you want to be able to use certain combat types, or even add obstacles to the terrain. You can also stake money and items against other players. If you win, you will be a little bit richer, but if you lose, you lose all the items that you staked. To get to the Duel Arena, either teleport to Lumbridge with the Home Teleport or Lumbridge teleport. 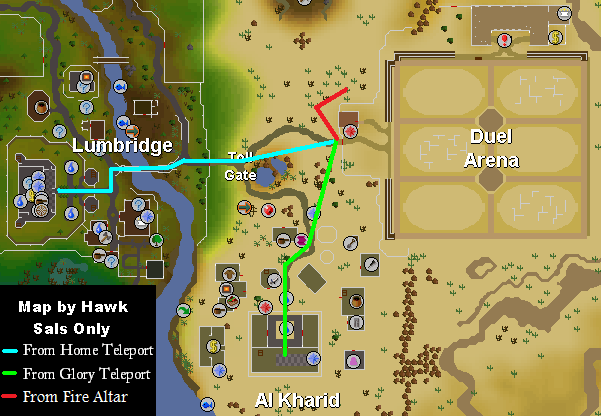 You can also use an Amulet of Glory to teleport to Al Kharid and walk north from there. If you take the Abyss to the Fire Altar, you can step out of the altar and go south to the entrance. You can also use a Ring of Duelling to get to the entrance. 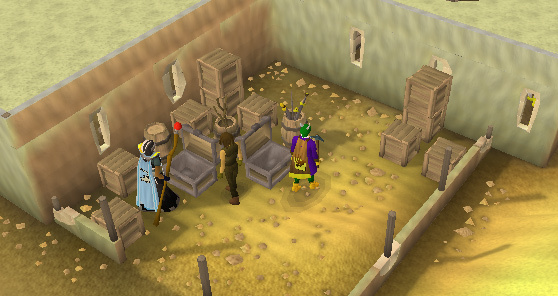 The bank is located on the eastern side of the Duel Arena, in an area with two chests. 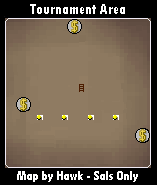 The chests are the banks. In that area, you will see a man named Fadli, who will sell you rotten tomatoes for 1gp each. The altar is located just north of the bank. At the hospital, you can get healed by anyone there. 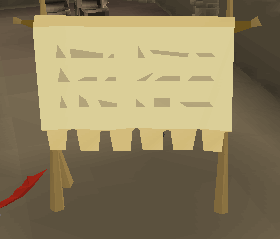 You can also buy the Constitution Skillcape. 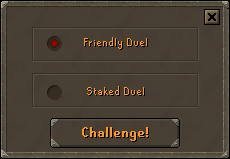 When you first arrive at the Duel Arena, you will notice an icon in the bottom right hand corner, which means that you are able to challenge someone. If you want to fight, right-click on someone and select the "Challenge Player Name." If someone challenges you, you will receive a message saying who is challenging you and what type of duel they are requesting. When you challenge another player, a window like the one below will pop up. Choosing "Friendly Stake" will open up a window listing rules, but no stake section. These duels are just for fun. Choosing "Staked Duel" will open up a window listing rules and a section for staking. The max amount of gp someone can wager depends on the amount of quest points both players have. The person who has the lower number of quest points sets the limit. 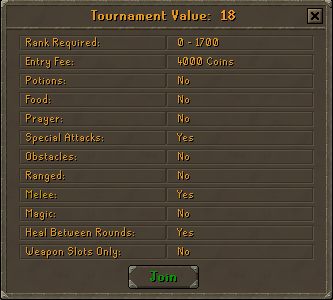 For example, if Player 1 has 160 quest points, while Player 2 has 120 quest points, the limit for staking would be 15,600 gp. If you want stake any items (you don't need to), be sure that you aren't afraid to lose them in the event that you should lose the duel. Any items staked will be lost to the other player. No Forfeit - Neither player is able to resign (give up) from the duel. You will have to fight to the death! No Movement - You and your opponent will be unable to move. No Ranged - You and your opponent can't use or wield any ranging equipment (like bows, throwing axes or knives); Melee & Magic allowed. No Melee - Neither player can use your hands to fight with; Ranged & Magic is allowed. No Magic - Magic can't be used by either player; Melee & Ranged is allowed. No Special Attacks - Neither player can use special attacks, if they have a weapon that can use 1. Fun Weapons - Special weapons like Flowers and other harmless weapons (like Holiday Items) can be used. No Potions - You and your opponent can't drink any potions. No Food - You and your opponent cannot eat any food. 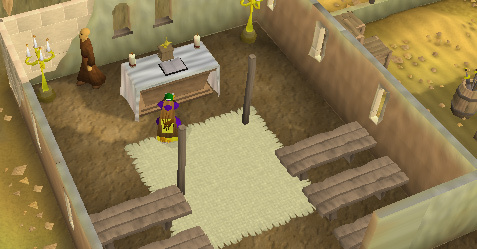 No Prayer - Neither player is able to use Prayer. Obstacles - these are helpful for Mages and Rangers to put a barrier between you and your opponent. These are explained below. No Summoning - Neither player is allowed to summon familiars during the duel. After accepting these rules, you'll see a confirmation screen of anything being staked, as well as the options that have been agreed upon. 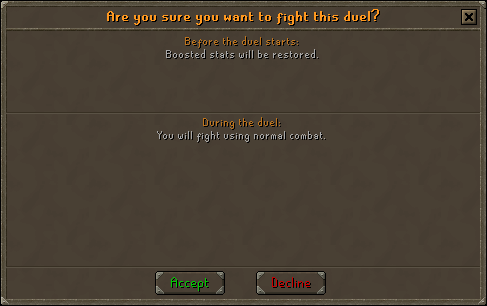 Double check these and then select 'Accept' to begin the duel! 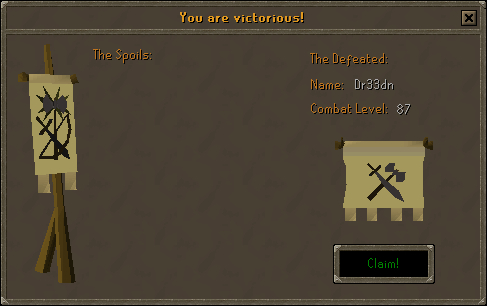 After you win a stake, a window will pop up showing the spoils that you won, you opponent's name, and you opponent's combat level. If you want, you can relax and watch a duel by climbing up on the walls. While up there, you are able to lean against the walls, and even throw a rotten tomato at the fighters below. 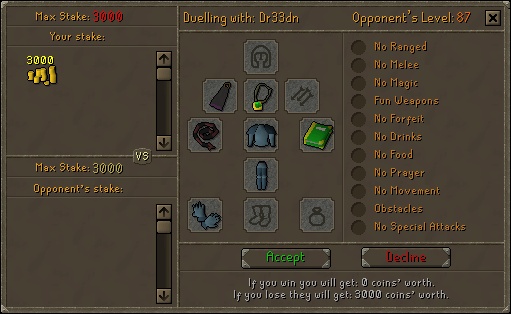 You can also fight in tournaments in the duel arena. Tournaments are held on only Worlds 54, 83, 114. Your tournament rank shows how many matches you have won and lost. When you first start out in the tournaments, your rank will be 1600 plus your combat level. For example, if you are level 57 and go down to the tournament area, your rank will be 1657. Staked and friendly duels do not affect your rank. When you first climb down the stair leading to the tournament registration area, you will see a message pop up. Downstairs, there is a bank, five registrars, a leader board, and spectators. Spectators usually give you good hints. The leader board shows the past several winners and runner-ups of tournaments. When you want to sign up for a tournament, talk to a Registrar and a window will pop up showing the rules for that tournament. After registering, in the top right-hand corner of your screen, a window will pop up showing the registrar the tournament is being held at, your rank, the tournament's value, the entry fee, and the time left before the tournament starts. All of the rules are the same, except there are two additions. "Heal Between Rounds" heals each player between tournament rounds. "Weapon Slots Only" lets you only use weapons and arrows. If the rules state that you can wear a certain item in the tournament, you will receive a message saying that you have to unequip it before starting. 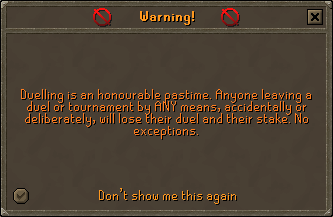 If you don't have enough money for the tournament that you are entering in your inventory, you will receive the message below. When the tournament starts, you will be taken to a waiting room. You will also be taken to this room once you have defeated your opponent. If you lose, you will appear in the hospital upstairs. The tournament is fought just like a normal duel, the only difference is the time limit. If you win the tournament, you will receive the following message and all of the cash from each person's stake.